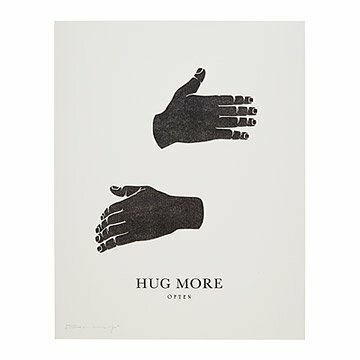 This photocopy transfer print renders a heartfelt reminder to "hug more." Author Virginia Satir once said, "We need four hugs a day for survival. We need eight hugs a day for maintenance. We need twelve hugs a day for growth." This print by Gregory Beauchamp renders a heartfelt reminder to "hug more" through photocopy transfer: An image is layered face down on the printmaking paper, and then a citrus solvent and patient hand-burnishing transfers the copy to the final print. More impressionistic than a screenprint, this method celebrates the subtle variations characteristic of a hand-printed image. Handmade in California. Print as expected except for the color. This artwork is not white or even off-white, it's more of an aged vintage cream. Disappointing but making it work because the print itself is unique and great for my space.